But anyway! This Saturday we are going to have some social time just hanging out! Bring your creative juices! We’ll be making magnetic bookmarks! I have all the supplies (like photos, paper, stamps, markers, ribbons and of course magnets) If you’d like to bring anything for yours or to share, please do! My sister saves magazine pictures she likes and made a few very cute ones from them. You can also bring any photos you have that you like. I made the square-ish one below from a photo and the other with a stamp and markers with some chalk dust in the background. 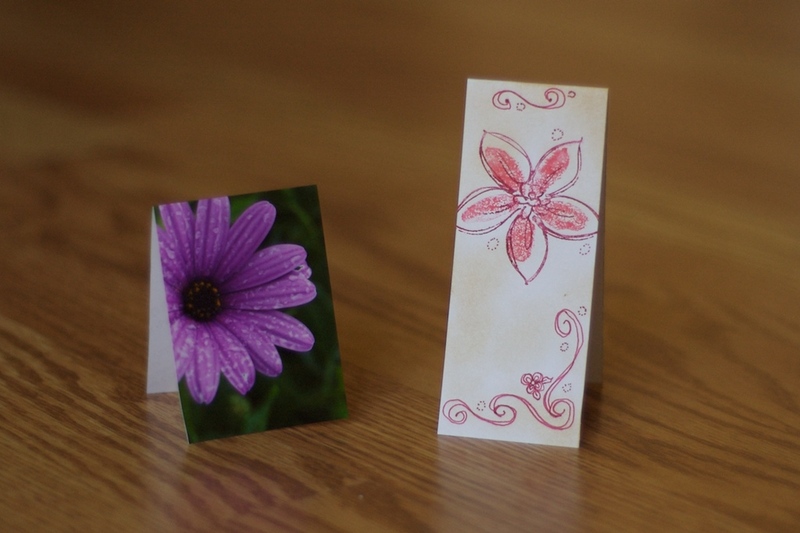 I seem to have a flower theme… can you tell I’m ready for spring! If you think they look cheesy then you should come and show me how to make them look cool! 🙂 🙂 I think this growing baby belly might be taking some of my creativity. Haha! Also bring something yummy if you’d like. So far I think we have mini scones and madalines. I’ll have an assortment of tea flavors and strawberry lemonade. Stay as little or as long as you’d like and just come! Hope to see you in a few days!!! Sarah, I am going to try and come. Unfortunately, I think our family keeps contaminating eachother. I’m OD’ing on Thieves and probiotics!